In addition to the Professional and Student Awards held each year, the Chapter recognizes members, students, and allied professionals for their outstanding work and distinguished service to the Chapter and the profession. To celebrate the extraordinary professional contributions of our late colleague, M. Meade Palmer, the Virginia Chapter of The American Society of Landscape Architects established an award in his honor. The M. Meade Palmer medal is awarded to individuals who exemplify the values, sensibility, and spirit reflected in the life and work of Meade Palmer. The Stewardship Award is presented for outstanding contributions to the protection and management of the natural resources of the Commonwealth. It is awarded annually to an individual or organization based upon nominations submitted by the membership, and voted upon by the Chapter Executive Committee. Nominations should be submitted to the Executive Committee by February 28th of each calendar year. 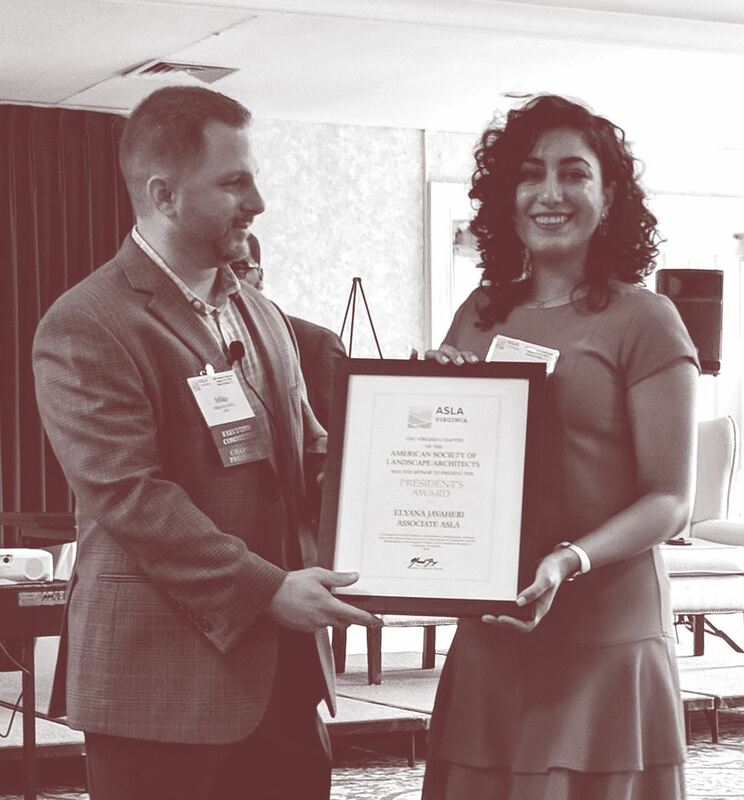 The Allied Professional Award is presented for an outstanding contribution to the profession of landscape architecture with national or state-wide, regional, or local impact in Virginia. It is awarded annually based upon nominations submitted by the membership, and voted upon by the Chapter Executive Committee. Nominations should be submitted to the Executive Committee by February 28th of each calendar year. The Distinguished Service Award is presented at the discretion of the Chapter Executive Committee to recognize an individual Virginia Chapter Fellow or member who has demonstrated sustained outstanding service to the Virginia Chapter. Nominations for this award may be submitted to the Executive Committee at any time during the calendar year. The Executive Committee considers potential candidates prior to the annual meeting each year. Presented at the discretion of the current Chapter President, the President’s Award recognizes the efforts made by one or more individuals on behalf of the Chapter and its programs over the course of the previous year. 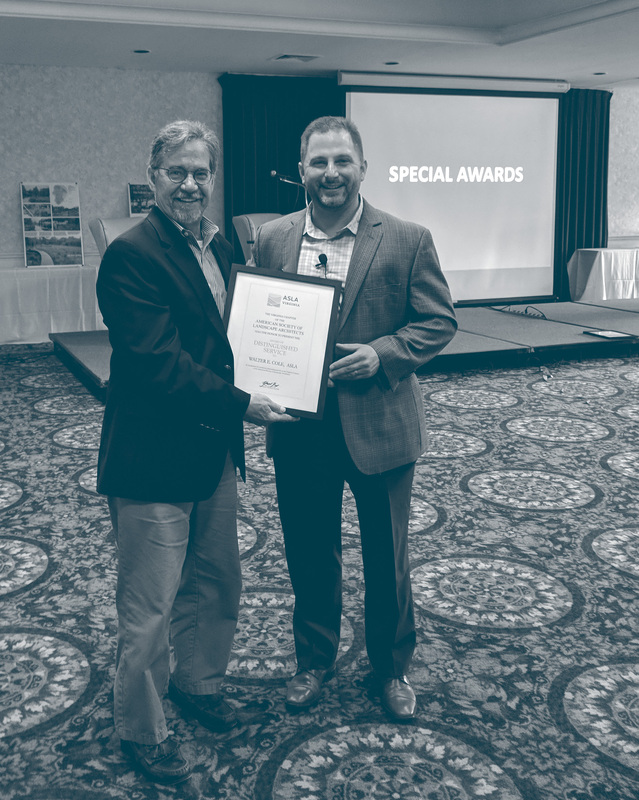 Each year, the Chapter recognizes two students, one at each of the accredited landscape architectural programs within the state—University of Virginia, and Virginia Polytechnic University—based upon the recommendations of the faculty. The student scholarship recipients receive a certificate and a monetary award at the annual meeting. Submissions must be to the chapter by April 1st.